This exercise alone will teach you how to draw and paint by just doing this often. You will be amazed at how your technique will change as you work this way. Be sure to include the format first in every drawing that you make!!! Over time this becomes second nature. Small paintings teach you everything that you will need to learn to eventually change mediums and change to larger or different formats if you want. ENJOY! This watercolor "set" is simply an 8 color set that often is referred to as a kid's set. The one that I am using here is made by Prang -- but any brand will do as long as the colors are deep and rich with no hint of white mixed into the color. Question: How can you tell if there is white in the color? Answer: The colors will appear to be pastels and not a pure deep rich color. These watercolor sets used to come as a metal container rather than plastic and thus they were called "watercolor tins" or a "tin of watercolor". The less expensive sets -- probably including this set -- can not be counted on to be particularly light fast -- and any paintings done with these inexpensive sets may fade more quickly when hung in or near sunlight and may fade over time in any case. You can use finer and more expensive watercolor sets or tubes of watercolor -- any that you want to use will be fine. Make sure that your set has a deep blue, a really red red and a yellow that is very yellow and not a mustard color. You also want a green that looks like a healthy grass color, an orange like a real orange and a darker violet or purple that can look almost black. You don't need white. In the transparent medium of watercolor the white comes through the color from the white of the paper. All other colors that you might find in larger or additional sets can also be used and may add to your painting fun. After you have your basic colors: blue, red, yellow (called the primary colors) AND green, orange and violet or purple (called the secondary colors) -- there are no wrong colors and MANY, MANY colors can be mixed and layered with your transparent watercolor paints. Painting with watercolor can be done on any paper -- it is way more fun to treat yourself to some inexpensive watercolor paper from time to time - or all the time! The paper that I am using here is paper from a 11" x 15" Strathmore Watercolor "cold press" pad called "heavy weight" paper It is not that heavy unless you are comparing it to computer printing paper. 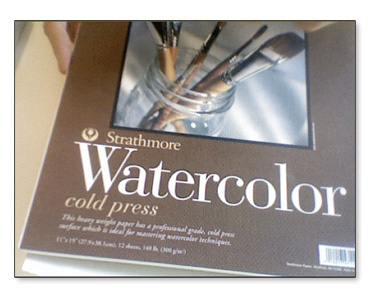 As watercolor paper goes, it IS on the lighter weight side. The thickness of watercolor paper is indicated by the weight in numbers. This sheet of watercolor paper is 140 lb. weight. A 300 lb. paper weight is the standard heavy weight for water color paper. When painted on even with very wet brushes the 300 lb. paper will not buckle much. "Stretching" lighter weight watercolor paper is possible to keep it flat while you are working it (search tutorials out on line for a demo). It is not necessary to stretch this paper here because we are just playing and the paper can be flattened later if you want. This particular piece of paper also is called a "400 Series" which means (in this brand) that it is acid free (archival) -- thus it is going to last longer -- but for what we are doing that isn't at all necessary. This brand's "300 Series" is not acid free -- costs less usually and is fine for what we are doing. Each brand of paper will describe their paper differently -- not to worry! Another Note: Different papers will have different textured surfaces and absorbency as well as the ability to "hold up" to lots of painting and possibly some scrubbing or lifting of color OUT -- experiment with many papers to get a feel for each over time. My students in my Art and Children class (adults learning how to teach art to children) are usually true beginners and they LOVE when I give them a piece of 140 lb. watercolor paper from my stash to try -- they are instantly hooked on the texture, the way the surface handles the water and the extra weight of the paper compared to what they may have painted on before. Can't paint just ONE! When you are ready to paint with either water or with paint -- you will need a good brush that will make your painting much easier, more satisfying and much more FUN. This is the TRUTH. Brushes that come with the set or just really cheap brushes should not be used. They often do NOT have tapered tips -- they are chopped straight off and are either too stiff or too wimpy -- meaning that they kind of fold over and collapse like a string mop when wet. Get a good brush -- they don't have to cost a lot but they have to be of a usable quality. Be sure to get a good brush before you do anything else! Brushes have numbers and as far as I can tell the numbers no longer have much relationship to the size outside of each brand and type. Don't worry about the numbers unless someone has suggested a very specific brush. For watercolor you want a "round watercolor brush" made out of sable, some sable or no sable. No need to get sable which is expensive. A nylon brush is fine as long as the quality and craftsmanship is there. A ROUND brush is the type of brush that comes to a point and the metal holder for the bristles is ROUND. Here I am using either a sablette (nylon) or a red sable blend (blended with nylon). They are very similar brushes. They are both called #10. The blend is a Utrecht #238. The nylon brush is also Utrecht -- number #228. Very simple stuff. 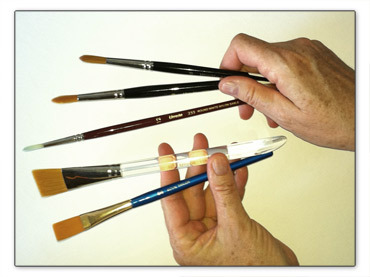 Get what looks to you like a small, medium and large round brush for your watercolor painting. You may also enjoy a flat brush -- make sure the the bottom of those brush hairs also come to a fine edge and not a blunt chop. Our first step is to center a drawn format on our paper. 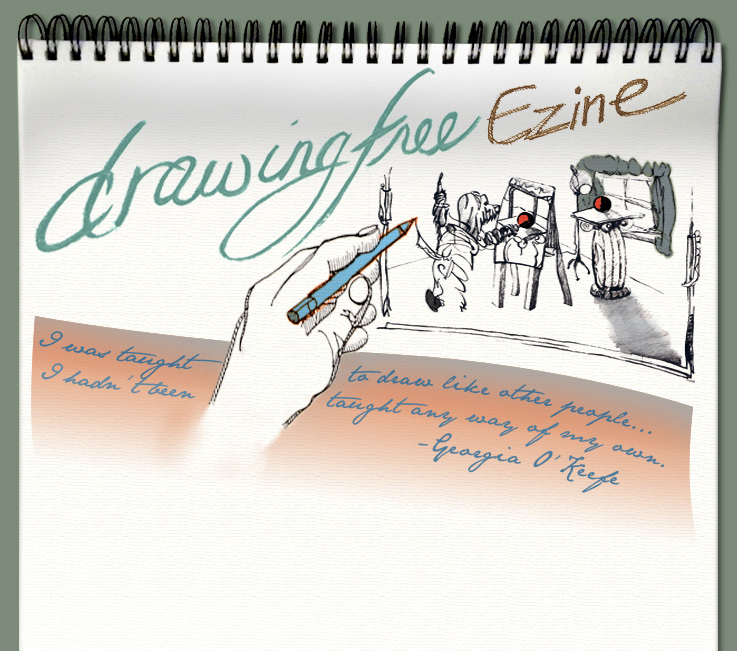 (See Drawing Free Ezine #1 for all about FORMAT). I drew a rectangle using graphite pencil lightly. You can draw your format any way you want and use any media that you want. I like to start with a light line that won't ultimately show and may be erased out later -- usually even through the (dry) watercolor later. Working within a format will help you to become sensitive to the very important relationship between your inner design (what you paint) and the outer edge of your work (the format). All viewing includes the total design which includes the edge or the "outer limits" of your drawing or painting as well as what is painted on or inside the edges. This is the overall picture! Into my format I am also drawing an "end to end squiggle" to give me some guidance. You may use this same squiggle or any other design that you want. You don't need to use a squiggle or any design in pencil. You can just use the watercolor without anything else and just let it flow and have fun. Either way you want to be sure to have fun and don't sweat it! I have gotten the urge to put clear water into one side of the squiggle to let that side have more freedom to run and flow. When you paint wet paint into wetted paper it is called painting "wet into wet". When you paint "wet into wet" -- everything softens and it also may run, flow and the color may migrate as the paper gets progressively more wet. Pre-wetting some of the paper also lessens the deepness of the colors as they become lighter and also more transparent when the colors combine with the water and the paper. You can paint "wet into wet" with the first coats of water being water WITH pigment (rather than just clear water). Now for the fun of the COLOR. When I open my set you see that I've already opened it and used it before. I don't clean out the set each time because I like to use the colors that have been mixed before in the tray. I also don't clean out the set because it uses up the paint really fast to be scrubbing the pigments clean and thus pulling too much paint out of the set just to clean it. There are those that will want to do this -- and you know who you are -- and that is OK. 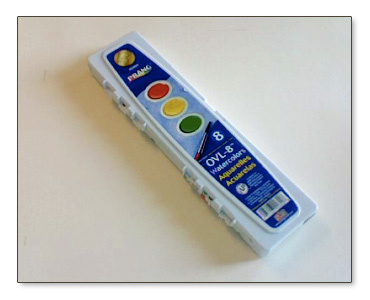 The lid of the water color set becomes a little tray to mix colors in when it is open. You dip your brush into water first and then the paint and pull some paint out (on your brush) of the little pot of paint. Sometimes when I start to paint -- I wet out all the paints first. You can do this by spraying the watercolor set with water with a spray bottle -- or by putting a drop of water into each the little tray or oval of each color. It takes about five minutes to soften to where it can be used easily. You can also soften the paint as you go into each color. I'm starting to paint the design with a yellow on one side of the squiggle. Just watch as I put it in holding the brush in different ways that work well with the areas that I am painting and the position of my paper. In the very first section it looks like I got more yellow in there in a thicker, deeper color and less transparent way than I wanted and I went back in with a clean and a dryer brush (wet but not very wet) to lift or pull some of it out -- sort of mop it back out with the clean brush. As you work you will learn all this over time -- just painting and watching and not trying too hard to get something real specific -- the looser you stay at first -- the better. Be easy with what you are doing and you will learn by doing and watching what happens. I continue to paint -- mixing colors in the tray and bringing them out over and around other colors that are already painted. When I paint the second side of the squiggle, I leave a little DRY white space of paper so that the two sides don't run together. I could have also let one side DRY completely before I painted the paint next to the line. In that case, the wet from one side would NOT attract and mingle with the new wet from the other side. Wet runs to wet -- not dry unless it is SO MUCH wet. Soon after leaving the dry white dividing line, I do put water with color into that dividing line and let water and thus colors that the water is carrying run together. I started this line with blue and made it change to purple and then orange as it wanders through the center of the composition. The whole paper can be tilted different directions to encourage and direct the excess water to more places that you want it to run or move. I'm also using some splattering with the painting. A little into the splattering I realized that it might be good to lay down paper along side the outer edge of the format to prevent the splattering from going outside the lines of the format. This masking of the outer edges could also be used as a technique with sprayed water and color to make patterns of fine spatter. EXPERIMENT! A word about clean up with watercolor. EASY! It will stain your new white nylon brush but it will never stick or "dry forever" in your brushes. Keep your jar of water clear and clean it or change it out often -- possibly using several jars or cups of water. Swizzle your brushes around in the water to clean and clear them between colors. And sometimes you will have to sort of clean out a color that is in the set to take it back to just the color that it is in the tin without any other colors. As you know, this happens mostly with the lighter colors -- especially yellow. Consider making one quick water color like this per night or per day. You will find that the flow of water and color will do much for your brain, body, mind and soul. Play with water and color every day!